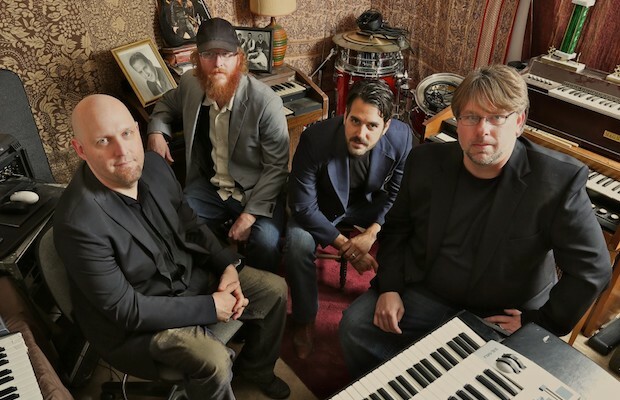 Reformed after a two year hiatus, and restored to their “classic” lineup with a great new EP in tow, hardworking jam band Perpetual Groove, known for their eclectic sound and amazing live show (complete with awesome lights), are back in Nashville for the first time in over three years tonight, Sept. 30 at Marathon Music Works! With support from locals LUTHI, who just took a full on funk turn with their new EP, this show is sure to be an exhilarating way to kick off your weekend and bid farewell to September, and tickets are still available right here! Read on for details below! Hailing originally from Savannah, Georgina, though now based in the musical hotbed of Athens, acclaimed jam band Perpetual Groove, often dubbed PGroove by their fans, reemerged last year after a short hiatus, reenergized and ready to bring their beloved live show back to the masses. Though their origins trace back nearly 20 years, the band initially began to draw attention following 2003’s Sweet Oblivious Antidote, building a quick reputation as one of the most hardworking, engaging, and talented bands in the jam scene, eventually finding an even wider audience by 2007’s LIVELOVEDIE. Blending elements of jazz, neo psychedelia, r&b, trance, electronica, progressive, and arena rock, the group’s eclectic sound and strong series of a original releases, coupled with a refined and unique live show complete with impressive, trippy, and celebrated lights, PGroove have become festival staples, drawing a cult following and clocking thousands of miles as they’ve toured the world near constantly for more than a decade. Since cementing their “classic” lineup and reforming after a break, the band released a new EP, Familiar Stare, earlier this year, and have managed the rare jam band feat of consistently drawing praise for both their live show and their recordings. To get the full experience, you should definitely seem them live, however, and even if you’re not a diehard jam band fan, we have a feeling you’ll find something to love about this group. Christian Luthi, who formerly made music under his full name, but now simply goes by LUTHI, a project which has grown to include a full array of backing players, grew up outside of Milwaukee, but has called Nashville home for a number of years. When we told you about him previously, and even hosted him at our own Acme Feed & Seed showcase, he was rocking a soulful, indie pop sound that managed to predate Nashville’s current pop explosion. With new EP Home Again, however, the LUTHI crew have fully embraced their funk tendencies, incorporating horns and keys and jam-ready vibes for an energetic and exciting sound that has them primed to open this show. You definitely don’t want to miss LUTHI’s latest! Perpetual Groove and Luthi will perform tonight, Sept. 30 at Marathon Music Works. The show is 18+, begins at 8 p.m. (doors at 7 p.m.), and tickets are available to purchase for $25. Catch Merchandise w/ Public Memory & Nightblonde | TONIGHT at 12th and Porter!